As I’m planning on snowboarding at Milton Keynes tonight I want to make sure my board is ready to go. It’s a bit dry after last week (indoor, man-made snow strips wax quicker than mountain snow), so I’ve given it a good coating of Zardoz topped off with One Ball Jay hot wax. 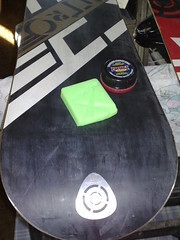 I’ll scrape it all off before I head off but for now the wax is soaking into the pores in the base ready to give a super speedy session tonight!